WHAT: Practices consist of working on fundamentals, technique, and cardio. Wrestling will challenge your kids both physically and mentally. Join us in supporting personal growth and physical activity this wrestling season. WHERE: Practices are in the Wrestling Room at Kennedy High School. Tournaments in January at Kennedy High School. 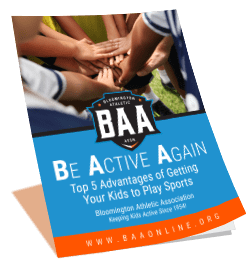 WHY: What benefits will your kids get from BAA Wrestling? EQUIPMENT: Each boy must provide his own wrestling or tennis shoes. BAA will provide singlet. BAA provides scoreboards and time clock and referees shirt and whistle. All wrestlers will wear their BAA singlet for tournament nights only. DO NOT WEAR YOUR BAA-ISSUED SINGLET TO PRACTICE. Wrestlers are to wear plain gym shorts, t-shirts, and wrestling shoes. No one will be allowed to wrestle with pins, buttons, zippers, pockets, loops, belts, or snaps. No jewelry of any kind, nor gum is allowed. Wrestling or tennis shoes are to be worn in practice and in meets at all times. No one will be allowed to wrestle in socks or with bare feet. If you do not have wrestling shoes, you may wear regular gym shoes. You need to make sure the bottoms are clean and hand carry them in and put them on when you get into the wrestling room. Do not wear your street shoes into the wrestling room at any time. We need to keep the mats clean and dry. Mouth guards are permitted with the parents assuming all responsibilities.